Wednesday night on “The Late Show with David Letterman,” host David Letterman welcomed Fox News personality Bill O’Reilly, who he took to task for his bias against President Barack Obama and his unwillingness to give the president credit for the things that he has accomplished. 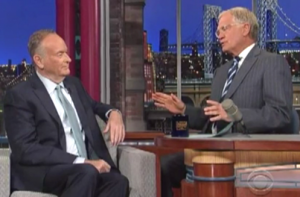 Letterman began with the killing of Osama bin Laden, a topic that clearly made O’Reilly uncomfortable. Letterman pointed out that capturing and killing bin Laden had sunken on the Republicans’ agenda over time, and brought up President George W. Bush’s statement in 2002 that he doesn’t really think about bin Laden anymore, a statement that O’Reilly denied the former president ever made. That claim that was refuted by Arizona Senator John McCain (R) in May of last year. In the end, both Letterman and O’Reilly agreed that the War in Iraq, however, was a failure and a distraction from the real security threats that face our country. Then Letterman asked O’Reilly why President Obama doesn’t get more credit for the things he has accomplished. O’Reilly tried to counter that while the President has done a good job on foreign policy, he’s botched the economy.